กระจุกดาวทรงกลม (อังกฤษ: globular cluster) เป็นแหล่งรวมของดวงดาวที่มีรูปร่างเป็นทรงกลม โคจรไปรอบ ๆ แกนกลางดาราจักร ดาวฤกษ์ในกระจุกดาวทรงกลมมีแรงโน้มถ่วงดึงดูดต่อกันค่อนข้างมาก ทำให้พวกมันรวมตัวเป็นกลุ่มทรงกลม มีความหนาแน่นของดาวค่อนข้างสูงโดยเฉพาะในจุดศูนย์กลาง บางครั้งเรียกชื่อโดยย่อเพียงว่า "globular"
"น่าประหลาดใจอย่างยิ่งที่วัตถุเหล่านี้ ซึ่งเราเคยคิดกันว่าเป็นหนึ่งในวัตถุที่เก่าแก่ที่สุดในเอกภพ ที่แท้เพิ่งมีอายุไม่มากนัก" เฟรเกอเขียนเอาไว้ในบทความของเขาซึ่งตีพิมพ์ลงในวารสาร Astrophysical Journal "นี่อาจส่งผลอย่างใหญ่หลวงต่อแนวคิดเกี่ยวกับกระบวนการวิวัฒนาการของกระจุกดาวทรงกลมทั้งหลาย"
↑ Frommert, Hartmut (August 2007). Milky Way Globular Clusters. SEDS. ↑ Ashman, Keith M.; Zepf, Stephen E. (1992). "The formation of globular clusters in merging and interacting galaxies". Astrophysical Journal, Part 1 384: 50–61. ↑ P. Barmby & J.P. Huchra (2001). "M31 Globular Clusters in the Hubble Space Telescope Archive. I. Cluster Detection and Completeleness". The Astronomical Journal 122 (5) : 2458–2468. doi:10.1086/323457. ↑ Schweizer (1981). "The halo globular clusters of the giant elliptical galaxy Messier 87". Astrophysical Journal, 245 (5457) : 416–453. ↑ B. Dauphole, M. Geffert, J. Colin, C. Ducourant, M. Odenkirchen, H.-J. Tucholke (1996). "The kinematics of globular clusters, apocentric distances and a halo metallicity gradient.". Astronomy and Astrophysics 313: 119–128. ↑ Harris, William E. (1991). "Globular cluster systems in galaxies beyond the Local Group". Annual Review of Astronomy and Astrophysics 29: 543–579. doi:10.1146/annurev.aa.29.090191.002551, เก็บข้อมูลเมื่อ 2 มิถุนายน 2006. ↑ Sharp, N. A. "M22, NGC6656". REU program/NOAO/AURA/NSF. สืบค้นเมื่อ 2006-08-16. ↑ Hogg, Helen Battles Sawyer (1965). "Harlow Shapley and Globular Clusters". Publications of the Astronomical Society of the Pacific. 77 (458): 336–46. doi:10.1086/128229. ↑ Talpur, Jon (1997). "A Guide to Globular Clusters". Keele University. สืบค้นเมื่อ 2007-04-25. ↑ Sigurdsson, Steinn (1992). "Planets in globular clusters?". Astrophysical Journal. 399 (1): L95–L97. doi:10.1086/186615. สืบค้นเมื่อ 2006-08-20. ↑ "Young and Exotic Stellar Zoo: ESO's Telescopes Uncover Super Star Cluster in the Milky Way". ESO. 2005-03-22. สืบค้นเมื่อ 2007-03-20. ↑ van der Marel, Roeland (2002-03-03). "Black Holes in Globular Clusters". Space Telescope Science Institute. สืบค้นเมื่อ 2006-06-08. ↑ Harris, W. E. (1976). "Spatial structure of the globular cluster system and the distance to the galactic center". Astronomical Journal. 81: 1095–1116. doi:10.1086/111991. ↑ Leonard, P. J. t. (1989). "Stellar collisions in globular clusters and the blue straggler problem". The Astrophysical Journal. 98: 217. doi:10.1086/115138. สืบค้นเมื่อ 2006-11-02. ↑ Finley, Dave (2007-05-28). "Star Cluster Holds Midweight Black Hole, VLA Indicates". NRAO. สืบค้นเมื่อ 2007-05-29. ↑ Shapley, H. (1917). "Studies based on the colors and magnitudes in stellar clusters. I,II,III". Astrophysical Journal. 45: 118–141. doi:10.1086/142314. สืบค้นเมื่อ 2006-05-26. ↑ Martin, Schwarzschild (1958). Structure and Evolution of Stars. Princeton University Press. ↑ Sandage, A.R. (1957). "Observational Approach to Evolution. III. 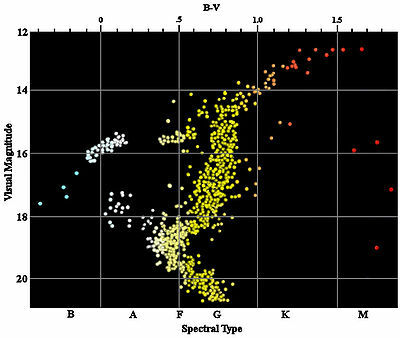 Semiempirical Evolution Tracks for M67 and M3". Astrophysical Journal. 126: 326. doi:10.1086/146405. สืบค้นเมื่อ 2006-05-26. ↑ "Ashes from the Elder Brethren — UVES Observes Stellar Abundance Anomalies in Globular Clusters" (Press release). 2001-03-01. สืบค้นเมื่อ 2006-05-26. ↑ 35.0 35.1 35.2 Benacquista, Matthew J. (2006). "Globular cluster structure". Living Reviews in Relativity. สืบค้นเมื่อ 2006-08-14. ↑ "Stellar Sorting in Globular Cluster 47". Hubble News Desk. 2006-10-04. สืบค้นเมื่อ 2006-10-24. ↑ Baldwin, Emily (2008-04-29). "Old globular clusters surprisingly young". Astronomy Now Online. สืบค้นเมื่อ 2008-05-02. ↑ Secker, Jeff (1992). "A Statistical Investigation into the Shape of the Globular cluster Luminosity Distribution". Astronomical Journal. 104 (4): 1472–1481. doi:10.1086/116332. สืบค้นเมื่อ 2006-05-28. ↑ Benacquista, Matthew J. (2002-02-20). "Relativistic Binaries in Globular Clusters: 5.1 N-body". Living Reviews in Relativity. สืบค้นเมื่อ 2006-10-25. ↑ Benacquista, Matthew J. (2006). "Relativistic Binaries in Globular Clusters". Living Reviews in Relativity (lrr-2006–2). สืบค้นเมื่อ 2006-05-28. ↑ J. Goodman and P. Hut, ed. (1985). Dynamics of Star Clusters (International Astronomical Union Symposia). Springer. ISBN 90-277-1963-2. ↑ Pooley, Dave. "Globular Cluster Dynamics: the importance of close binaries in a real N-body system". UW-Madison. สืบค้นเมื่อ 2008-12-11. ↑ Staude, Jakob (2002-06-03). "Sky Survey Unveils Star Cluster Shredded By The Milky Way". Image of the Week. Sloan Digital Sky Survey. สืบค้นเมื่อ 2006-06-02. หน้านี้แก้ไขล่าสุดเมื่อวันที่ 15 พฤศจิกายน 2561 เวลา 22:28 น.